Why is cooling better w/case horizontal? Discussion in 'Overclocking & Cooling' started by hdtvnut, Feb 11, 2019. In bench tests, the Arrow performs more than two multiplier factors below my custom cooler with an HK IV, EK D5-res and Nemesis 360GTX. For long videofiles using all cores at 100%, the water system cpu reaches 78 deg C after 30 min or so at X46/Vcore 1.200. The Arrow reaches 84 C with X44/Vcore 1.120. I've confirmed that the input air to it is within two deg of ambient 25-26 deg. I was hoping for better, given the huge size of the Arrow, but it seems limited to handlimg 275w tdp at 85 deg on this cpu.. However, when I populated the case, I saw temp during the same test (and several others) elevated by about five deg. Was thinking I needed more/better case fans. Surprise: when I laid the case flat, the temp curve went right back close to the open bench numbers. I have experimented with re-pasting, bracing the Arrow in case it is losing some contact with the IHS, and baffling or blocking the air, and sides on or off, but nothing seems to affect the 4-5 deg improvement when the MB is horizontal. What's going on? I seem to recall that some of the heatpipe coolers are more effective with the pipes perpendicular to the horizon. When you lay the case on it's side the pipes are now facing up instead of sideways. Believe it is a combination of (1) how heatpipes work in general and (2) on what is inside the pipes as they are not all using the same internal "wicks". Perhaps some of this is coming into play in your situation. Thanks for your reply - I have never heard of this before. Will research more. Pretty sure it's a function of the heatpipe design. A heatpipe has liquid in it that evaporates at fairly low temperatures (not sure what exactly). When it hits the base, it gets evaporated and travels up the heatpipe, where it cools and then travels back down the heatpipe by wicking action. By having the case horizontal, the wicking action is aided by gravity rather than fighting it in half of the heatpipes, resulting in more rapid heat transfer. It sounds like the design of cooler heatpipes that I've seen so far just isn't correct for vertical (almost all) motherboards these days. The pipes need to turn 90 deg as soon as away from the baseplate and go upward, parallel to the MB, and the fins/fans would mostly have to be in the top of the case. The case would have to be designed to match. Has anyone attempted such a beast? Based on my tests, I don't believe even the biggest present design air coolers can support high-tdp (150-range) Skylake-x and similar chips in OC mode. Anybody disagree? This is about the closest to your specs your going to find......compatibility ends at 775 though, maybe it can be modded.....if you can get it to fit. So not matter what I say without all conditions understood in detail any answer I give is likely wrong and debunked when facts are known. Try elaborating on the setup and conditions for a more qualified answer. Owcraftsman, the first tests were on open bench, Asrock X299 OC Formula board, horizontal, no clutter nearby to affect air flow. Ambient 25.5-26 deg C. Cpu 7980xe delidded by SL. Seasonic Prime 1000w platinum. 64GB Corsair LPX 3200. 1080ti ftw3. Power set to Hi Perf. AVX -3, -5. BCLK 100. The object was to change from water to air with no other physical changes, to compare multiplier/Vcore which brought the package temp to a stable point at or below 85 deg peak. The water system: Heatkiller IV, Nemesis 360GTX, Noctua 2000 rpm fans, and EK d5-reservoir. At X46, Vcore 1.200, temp stabilized at 82 deg average, 85 deg peak. 310 average tdp, 317 peak. Delta across the radiator 4.3 deg. X47 seemed to require raising Vcore some more for stability, so I stopped (this paragraph edited as I read over my data; was getting sleepy). The air system: Silver Arrow IB-E Extreme twin-tower with TY-143 hi-speed fans. At X44, Vcore 1.120 manual override, stabilized at 81 deg average, 84 deg peak. 265w average tdp, 275w peak. Delta across the towers 8 deg. Fans were at max most of the time, noisy. Bearing in mind that these were wide-open tests, I don't see how to argue much with them. I re-checked my Arrow paste to make sure it was in contact, but not too thick. Then I populated the Corsair 750D Airflow with the Arrow mounted, and found that with the case flat (closed or open), I got within a deg or two of the open bench temps. This with two high quality 140mm front fans. My thermocouple measured only 1-2 deg rise from ambient to the Arrow input after 30 min. The surprise was that when I stood the case up, the temperature curve shifted upward to stabilize five deg higher, at 89 deg peak. I tried bracing the Arrow, case side on and off, blocking ventholes and baffling air several ways, but these didn't affect the temp more than a deg or two. However, the 4-5 deg difference in long-term heating with position would start showing up during the first minute of a run regardless of other changes. This seems at least consistent with the Arrow heatpipes not working well when horizontal. The lesser capability and position problem certainly seem to me to favor the custom water system, at least over the Arrow Extreme air. What X299 MB-compatible coolers do you guys suggest as better? That much better? I will assume you use GPU acceleration and have your front fans set to intake and 1 rear fan set exhaust and 2 fans in the top set to exhaust. If not why not? The problem with GPUs w/aftermarket triple fan, HS like the 1080ti FTW3, is heat dissipates all sides to increase throughput which dumps a huge amount of heat into the case. That heat would directly mingle with the intake of the CPU Air Cooler. Less so of course when in the flat horizontal position and even less with the side panel off. Only blower-style GPU HS get the heat out of the case. The others look pretty but not all that practical as you have witnessed. If I have a recommendation, get at least another GTX120 rad put all of them in push-pull and get a water block for the FTW3. Those rads have 16fpi and benefit greatly with the push/pull config. The problem with that is your case is not very practical for that considering you want both rads exhausting heat and with push/pull there is not enough clearance top or front (maybe front). The only mass produced case I would recommend is the Phanteks Enthoo Primo, but an 800d or 900d would do it too. Thanks for the tips on case cooling. My thermocouples allow me to measure the air into the Arrow, so I know it is close to ambient, within two deg C. I think with the right case and fans, I might be able to bring this down to less than one deg. The GPU is essentially idling. But the horizontal/vertical change seems unrelated to case issues. I've tentatively decided that either the Arrow heat pipes are not the best design, or they have contaminants in them, based on more reading. But to me, the main issue is: can the Arrow and similar size coolers, even at their best, match a very good water cooler at the 300+w tdp level with a chip like the 9980xe or relidded 7980xe? If anyone has such a setup, please describe. The main evidence is the open bench tests, where I am assured of ambient air into the rads, verified by the thermocouples. The Arrow just doesn't seem up to it, even though it has high-speed TY-143 fans, which are running flat out most of the time during my tests. Yes, they can, but you will be running very high speed fans to achieve that. If you look at the surface area of a radiator and the surface area of a large air cooler, the air cooler has at best the surface area of a moderately thick 2x120 radiator. 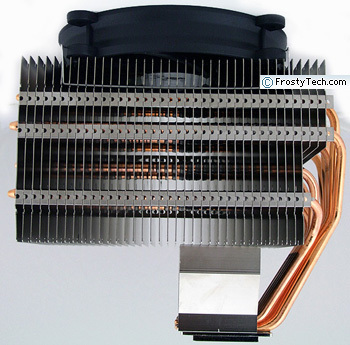 Most watercooling radiators use copper, which has better heat transfer properties than the aluminum used on heatsinks. Additionally, the small channels in a radiator will spread heat to the fins much quicker than the heatpipes on an air cooler would. This video has a good explanation on how heatpipes work. You will see that by design, heatpipes will be less effective when placed horizontally than vertically. 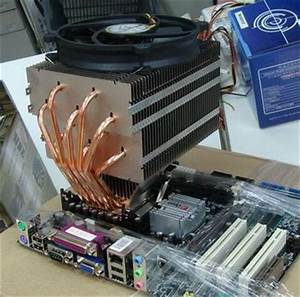 There are limitations on how heatpipes can be oriented on a CPU cooler, and thus compromises will always be made. Ideally the heatpipes will extend straight up from the CPU, but there is virtually no case that can support a heatsink like that with the motherboard in a vertical position. The Arrow has two 140mm 2500 rpm TY-143's. 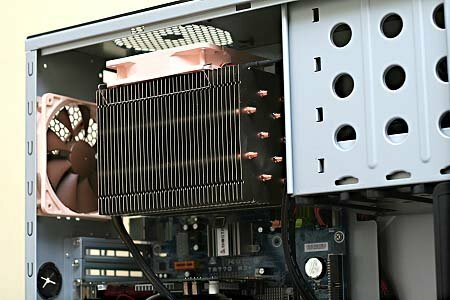 So the obvious question: since 99% of users will have a vertical MB in a vertical case, how can air coolers with heatpipes that end up horizontal be very effective? It seems like someone needs to design a high-wattage cooler with pipes that turn upward, and a vertical case designed to support it, with the output air ported directly thru the rear panel. Re-installing my water system, I worked with the fans and was able to get my 7980xe multiplier up to X47 all core at 1.240 Vcore with 85 deg max (340w tdp) on my long video files. Two TY-143's in the front, three Silent Wing hi-speed 120's on the 360gtx, which IIRC, is 54mm thick copper. I don't think I'll get close to that with the Arrow, but I have another of the same MB's I can use to continue to test it on the bench. I don't think much of its mount hardware; it has just two small phillips screws holding a clamp supporting the whole assembly. This flimsy scheme, which should include a brace, and the cooler itself only seem to make sense for a horizontal motherboard. There is no way any air cooler can match up to a 3x120 thick radiator, not unless it has some 3000+ RPM fans. Edit: also, the market for such cases is extremely small. With affordable AIOs all over the market now, people would rather go that than a weird case with a weird cooler style. Probably so. But I thought if the Arrow setup wasn't so much off from the water, I might use it. Even horizontal, not close enough.